So good and so easy to make! Five ingredients, fifteen minutes to prepare, and 4 hours to cook! That’s my kind of meal! You probably have all of the ingredients on hand right now. Try it, you will be amazed at it’s goodness. Perfect comfort-food meal. Sometimes the best recipes are ones that you simply just throw together without knowing the outcome. 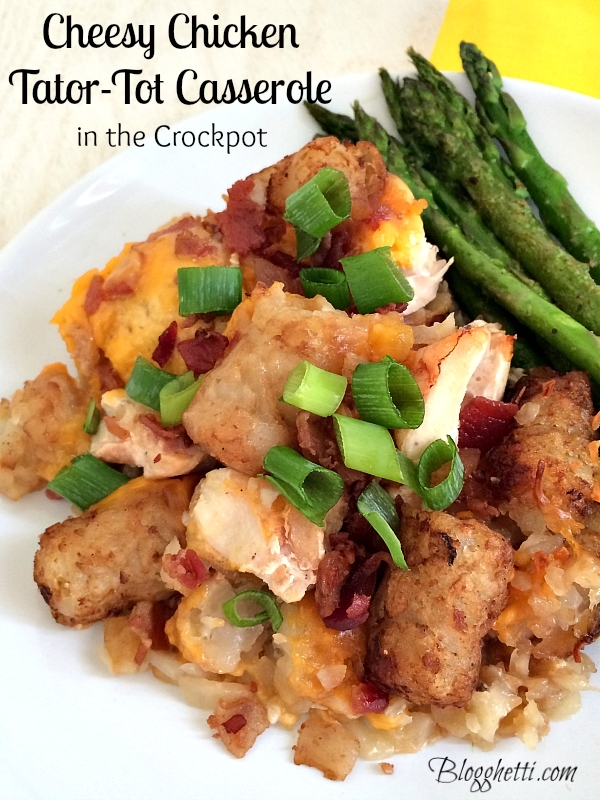 This Cheesy Chicken Tator Tot Casserole in the Crock Pot is one of those recipes. It’s an easy recipe since you just add the ingredients and then let it slow cook for a few hours. So good and so easy to make! Five ingredients, fifteen minutes to prepare, and 4 hours to cook! That's my kind of meal! You probably have all of the ingredients on hand right now. Try it, you will be amazed at it's goodness. Perfect comfort-food meal. Spraycrock pot with nonstick cooking spray. 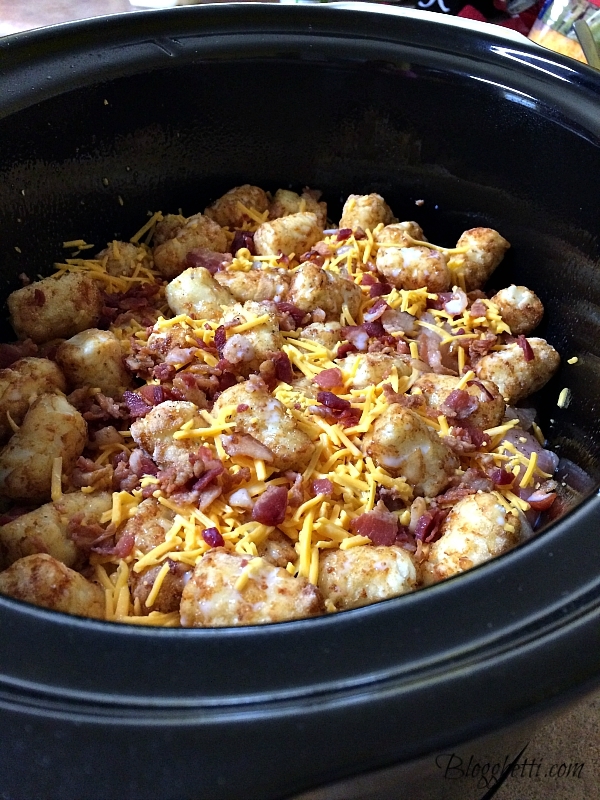 Place half of the frozen tater tots on the bottom of the crock pot. Sprinkle with ⅓ of the bacon pieces. Top with ⅓ of the cheese. Add the chicken on top. Season with salt & pepper. Next, add ⅓ of the bacon pieces and ⅓ of shredded cheese. 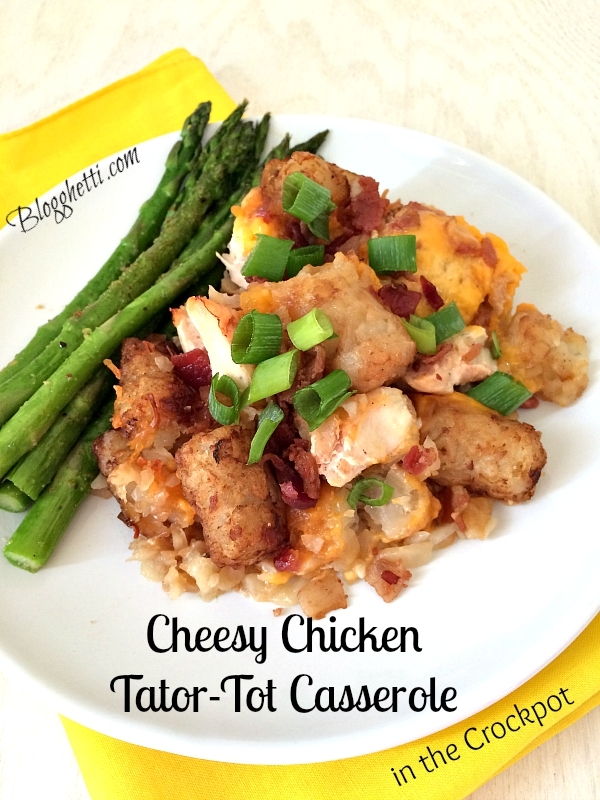 Place the rest of the frozen tater tots on top. Finish with the remaining ⅓ cheddar cheese and remaining ⅓ of bacon pieces. Pour ¾ cup milk all over the top. Cover and cook on low about 4-6 hours. Check it at the 4 hour mark as some crock pots do cook faster than others. I wish you had a button so I could print off your recipes. Marilyn, some of the older recipes do not have one as when I moved from Blogger to WordPress that feature was lost. I am slowly fixing that but you can highlight the recipe and right click and print it that way. Or if you like, I can email you the recipe. I apologize for this!